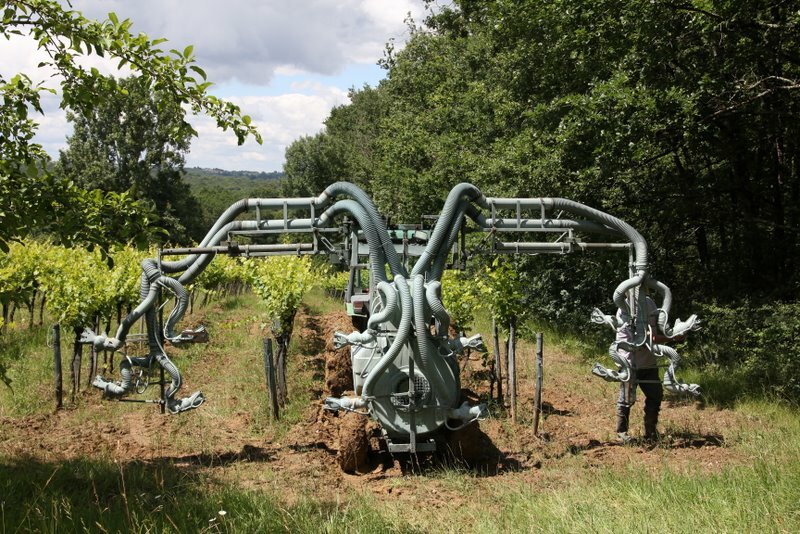 This Doc-Oc mishap is a specialized piece of viticulture equipment used to spray the vines with a copper sulfate solution. This anti-fungal agent smells strongly of sulphur — an odor that has not yet washed out from our work shirts though we have not touched a vine in almost 6 weeks. It’s attached to a special, extra-skinny John Deer tractor nimble enough to navigate the narrow rows. To see one these rumbling towards you, emitting a wall of noxious, light-blue gas, can be intimidating. I thought perhaps it was a work of art from your host in Umbria. I think the Museum of Modern Art should have one on display in its functional art section.